Welcome to the very first edition of, Memoirs of a 178 year-old Farmhouse! This is the very old, (and very intriguing) farmhouse that I grew up in, and of which my parents still reside in, to this very day. This house was built in 1838, and is one containing somewhat of a colorful history, as at one time, it was an inn with a saloon, bordering the railway tracks in the now sometimes forgotten, community of Anson, Ontario. I have always been completely intrigued and fascinated with this farmhouse, whether it be antique and treasure hunting, ghost stories, or just plain research and facts. One of the remarkable things about this beautiful old farmhouse is that believe it or not, there are still a few rooms in the home containing the original wallpaper…. and oh — what wallpaper it is! This is the wallpaper that can be found in the old saloon, or in what we refer to as “the Bar-Room”. In this tiny room, you can actually tell exactly where the bar tender stood, as that spot in the floor is worn down and indented. My parents absolutely hate this wallpaper, but I of course, love it! It looks a little orange-y in the photos, but don’t be fooled… it is pretty pink! Below is the wallpaper from the old basement stairway…. I can’t be sure, but I assume that it would have consumed the entire kitchen at one point in time. It is definitely tied in first place with the bar-room wallpaper, as my favorite! The most ornate original room left in the house, is the room that was at one time used as the parlor room. It has beautiful wooden moldings around the windows and doors, and beautiful intricate wooden paneling beneath the windows. 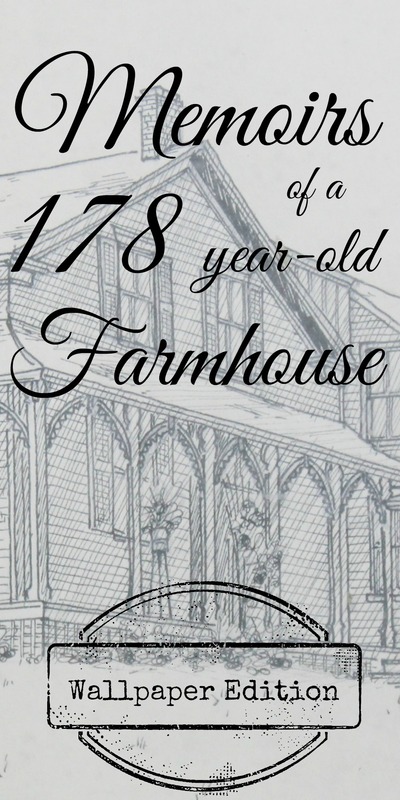 I hope you enjoyed this first edition of, Memoirs of a 178 year-old Farmhouse! Lots more to come, as I cannot wait to share more with you! This entry was posted in DIY & DECOR, HOMEKEEPING and tagged Anson, Antique, farmhouse, history, inn, Ontario, saloon, wallpaper by Sarah. Bookmark the permalink. Wow, what a neat story and pics. I too love the paper. Can’t wait for next “chapter”!